December is here! I’m celebrating my favorite time of year the only way I know how…by cooking with all of the flavors that remind me of the holidays, all month long. 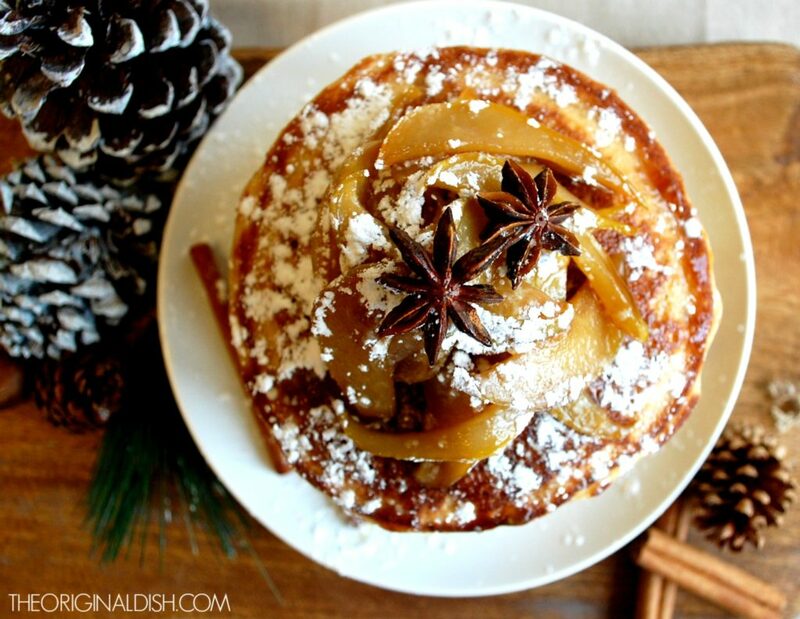 So light a fire, grab a blanket, and cozy up for a December full of wintery treats. I’m starting off with the most important meal of the day: breakfast! 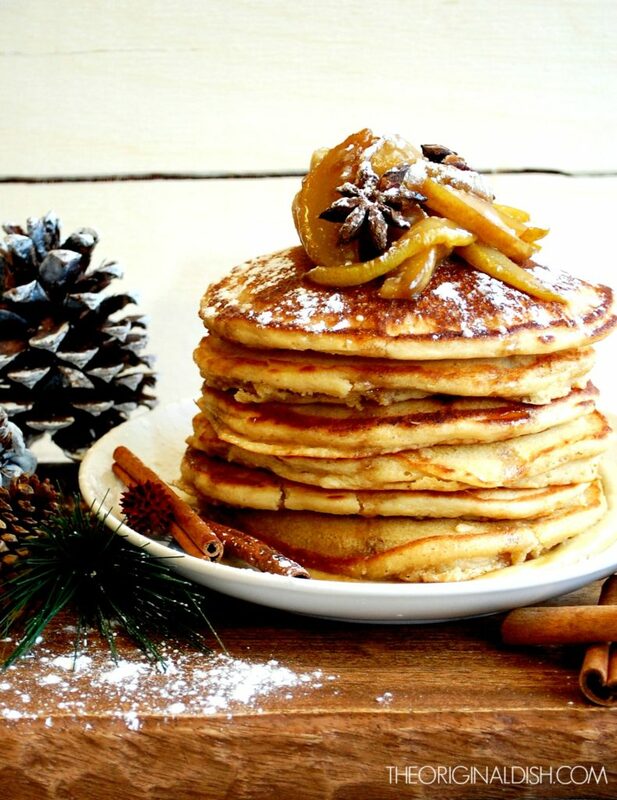 And with a breakfast like this, it’ll feel like Christmas morning is already here. I often make pancakes for our family breakfasts, but I’m never quite satisfied with how they turn out. Always yearning for something better, I decided to give it another try. The result? Well, my dad said they were the best pancakes he’s ever had, so I’m going to take his word for it. I use brown sugar in the batter for a deeper flavor. 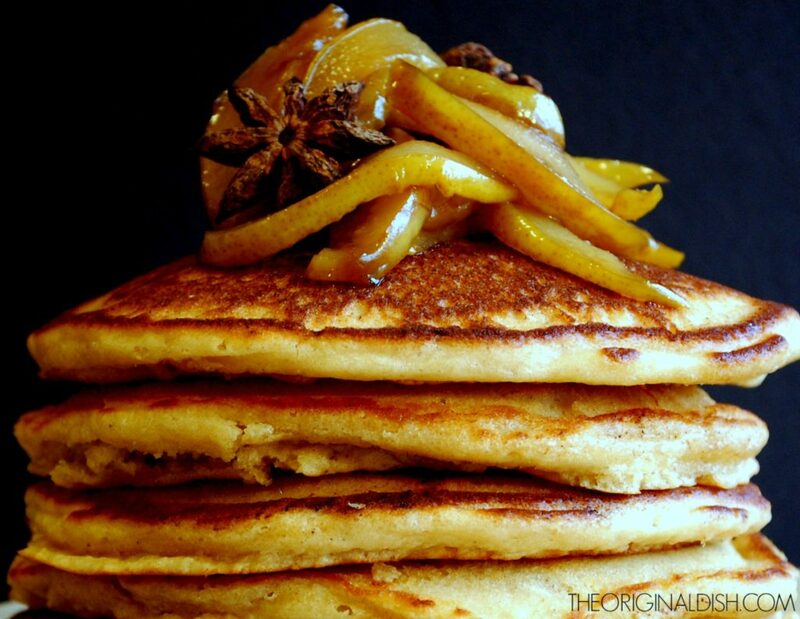 The brown sugar combined with melted butter make these pancakes extra special. A little nutmeg goes a long way to give a subtle spice to every bite. Once the batter is combined, I ladle out a fairly large amount onto a griddle and cook until just golden brown on each side. They’re fluffy and indulgent, a great go-to batter to have. I made the pancakes somewhat plain just so I could add a ton of flavor on top. My grandma always talks about the Italian tradition of roasting chestnuts for Christmas, so I was inspired to make a chestnut cream for the pancakes. I start by roasting them in a hot oven, and let me just say, be careful! I’ve exploded many batches before (the nuts literally explode) because I skipped over the crucial step of cutting into the chestnuts before they roast. You’ll want to make an X through the skin, barely piercing the flesh, using a very sharp knife. This will allow steam to escape and prevent the clean up of a large mess. Once the chestnuts are roasted and peeled, I simmer them in milk and puree them. I make a custard base using both the infused milk and the pureed chestnuts. This mixture is cooked just like a crème anglaise, whisking egg yolks and sugar before tempering with the cream mixture. Once cooked to coat the back of a spoon, the mixture must be strained because the chestnut puree is thick and somewhat course. (The texture of the cream won’t be completely smooth, but the flavor is worth it.) This cream is a rich and decadent accompaniment for the pancakes, now all they need is a little syrup! 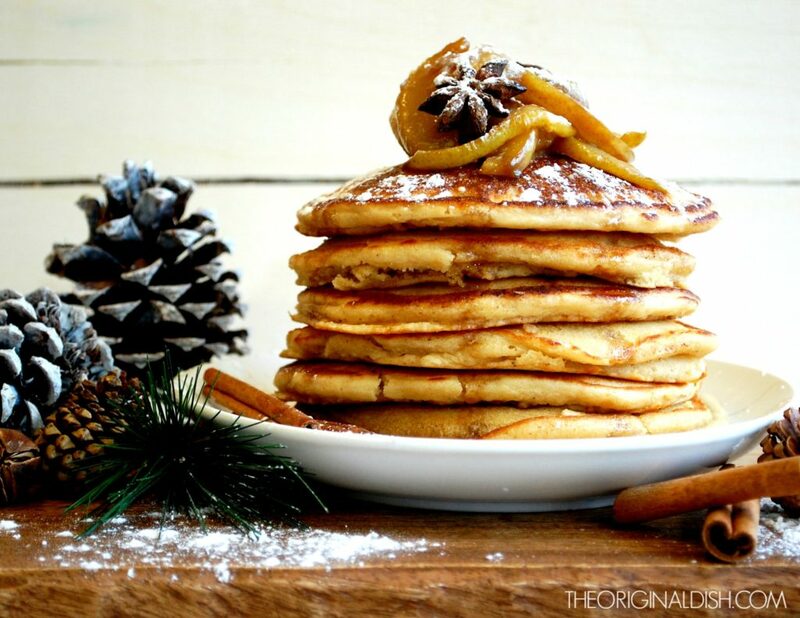 The syrup is really simple to make, but the flavor is what truly makes these pancakes a wintertime delicacy. I start by slicing pears thin enough to soften and thick enough to hold their shape when cooked, a perfect balance. I heat up some butter until it is just browned and toss in the pears. 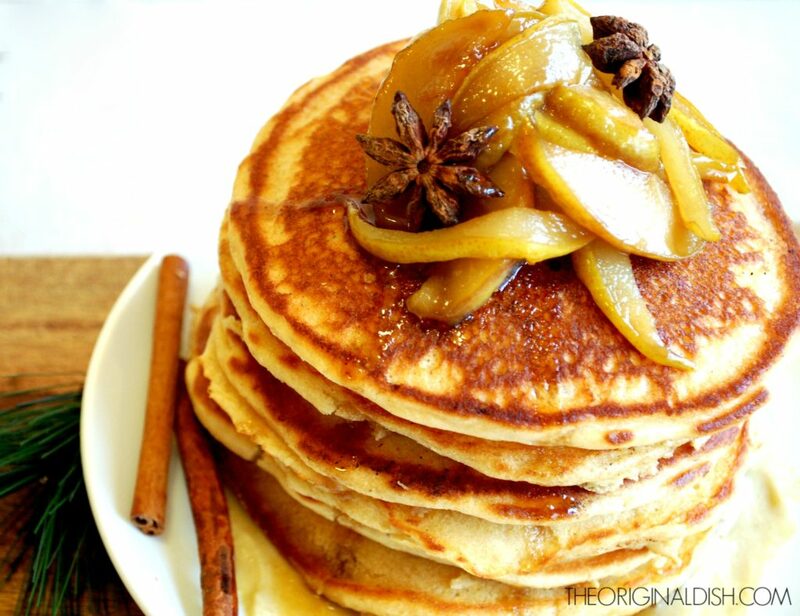 Brown sugar creates a syrup and carries on the flavor of the pancakes. And now, the spices! A cinnamon stick, whole cloves, and star anise add a wonderful warm spice to the syrup, infusing all of their flavor into the pears. 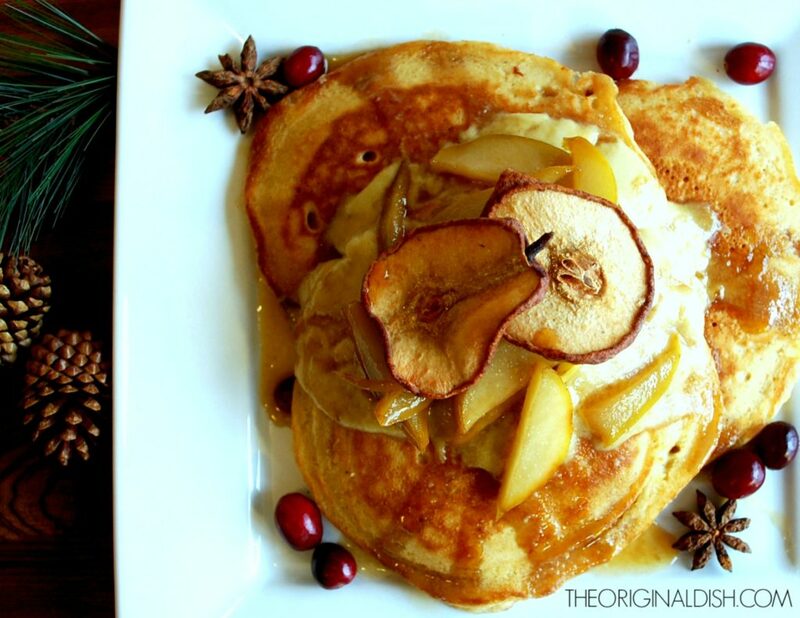 This syrup combined with the chestnut cream will have you making this recipe all winter long! Combine the roasted chestnuts, milk, cinnamon stick, and salt in a small saucepan. Simmer on low for about 20 minutes until the milk is infused. Strain the chestnuts, reserving the milk. Puree the chestnuts in a food processor, adding a tablespoon of the milk mixture at a time to help create a smooth puree (I used about 5 tablespoons). Transfer the leftover milk to a liquid measuring cup and add enough heavy cream to equal 2 cups total. Transfer this liquid to a small saucepan. Over medium-low heat, bring the liquid up to just barely a simmer (be careful not to boil). Meanwhile, vigorously whisk the egg yolks in a large bowl until pale in color. 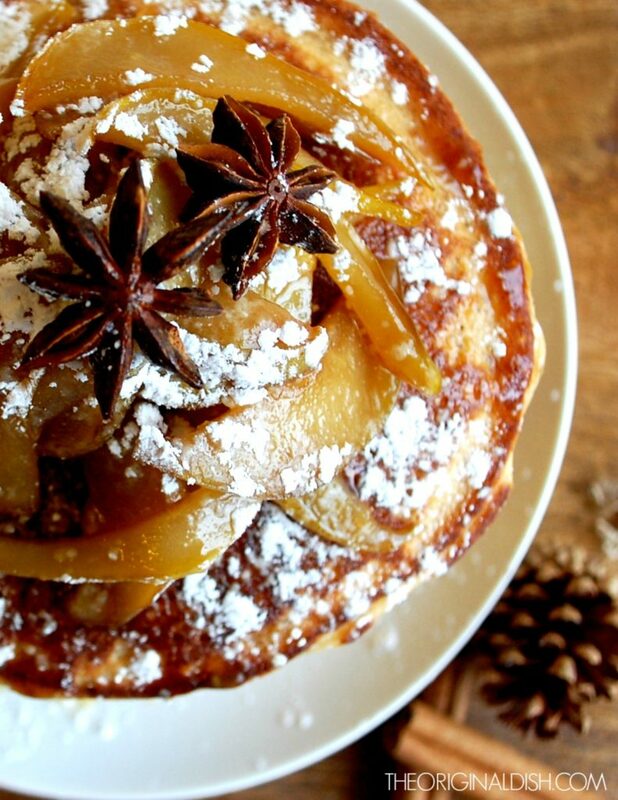 Whisk in the brown sugar, granulated sugar, and ¼ cup of the chestnut puree. When the liquid has heated up, pour half of it into the egg mixture in a slow, steady stream. This will temper the eggs. Then, pour the tempered egg mixture back into the saucepan. Cook on medium-low heat until the custard thickens and coats the back of a spoon. Pour the custard into a bowl and stir in the vanilla extract. Let cool slightly before serving. Whisk the flour, brown sugar, baking powder, salt, and nutmeg together in a large bowl until incorporated. In a separate bowl, beat the eggs. Add the milk, vanilla, and melted butter to the eggs. Whisk to combine. Pour the wet ingredients into the flour mixture, whisking until the flour soaks up the liquid and the mixture is homogenous. Heat a griddle or skillet over medium heat. Working in batches, add a tablespoon of butter at a time to the griddle or skillet and let melt (it will take only seconds). 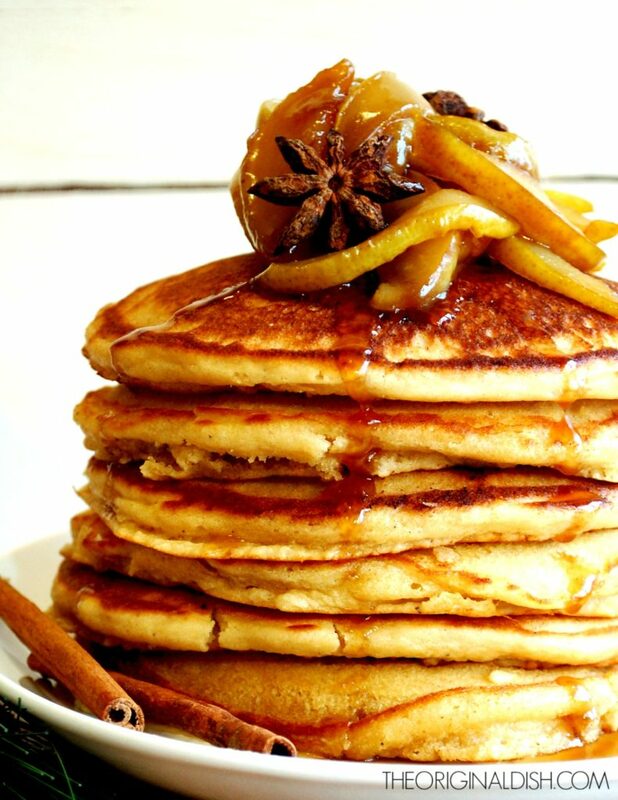 Ladle the pancake batter onto the surface, creating your desired size pancakes and evenly spacing them apart. Cook on one side until golden brown and bubbles begin to form on the top. Using a spatula, flip the pancake over and finish cooking on the other side. Keep the pancakes warm as you finish cooking all of the batter. Meanwhile, heat a large sauté pan over medium-high heat. Add the butter. Just when then butter begins to brown, throw in the sliced pears. Sauté for a few minutes, until the pears begin to soften. Decrease the heat to medium-low and stir in the brown sugar. Add the water, cloves, cinnamon stick, star anise, and salt. Stir to combine and let the syrup simmer until smooth. Serve warm. Spread the chestnut cream onto a plate. Stack the pancakes. Spoon out some of the pears and drizzle the syrup all over the top. If you are roasting the chestnuts yourself, first preheat the oven to 425°F. Using a very sharp knife, cut an X in each chestnut, all the way through the skin and just piercing the flesh. Roast the chestnuts until golden and the skins start break away from the flesh, about 10-15 minutes. Keep a close eye on them as they roast. Depending on your oven and the chestnuts, they will take different times to cook. You will have extra chestnut puree. Refrigerate in a sealed container for making these pancakes again or for another use (you could add it to soups or other purees). Thank you!! I mentioned you when writing about the chestnuts 🙂 You should try the recipe or we will make them when I am home! 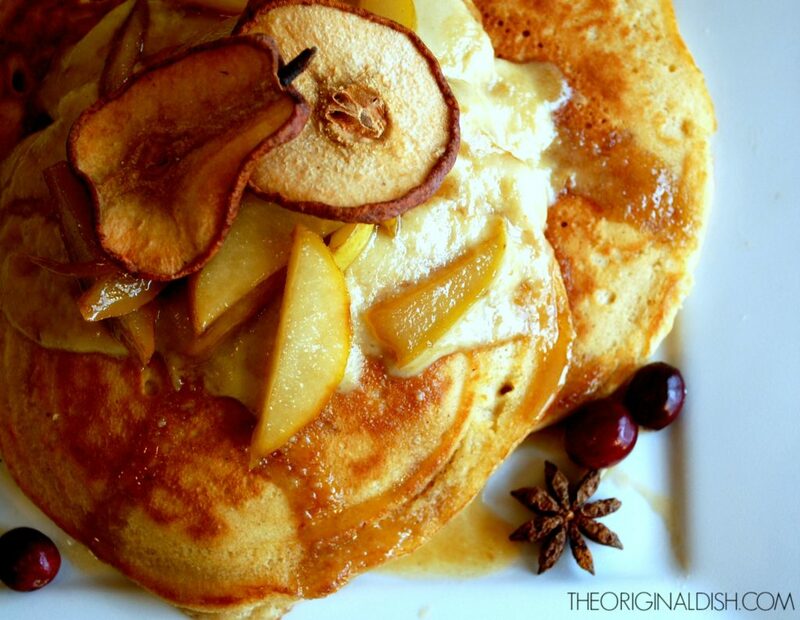 Wow these pancakes look incredible.. and beautifully photographed too! 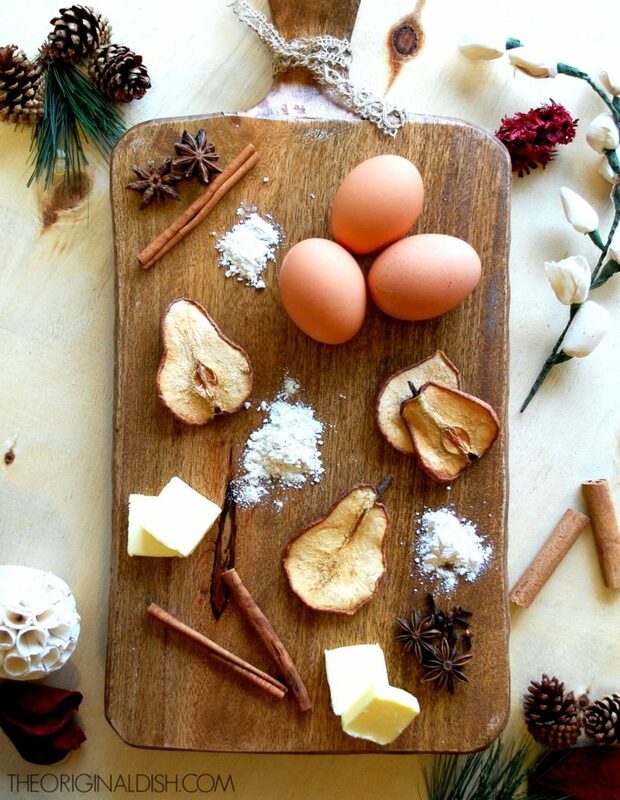 Loving the idea of a chestnut cream especially, it’s perfect for Christmas! Thank you so much!! The chestnut cream turned out extremely tasty. I tried to make it look like Christmas to I’m glad you think so! Hi Kayla! What is the star garnish that you used?? Thanks 🙂 Looks amazing, can’t wait to try! Wow! That looks amazing! I love everything about breakfast. 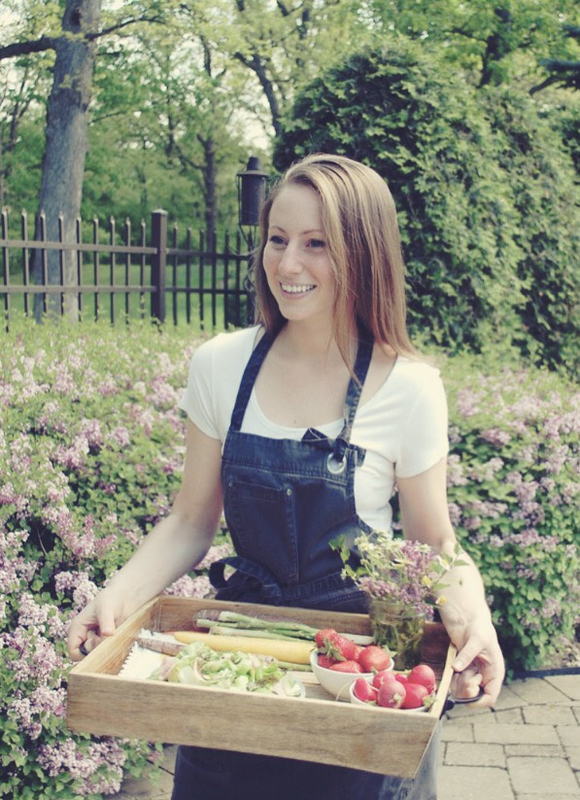 I’d love for you to check out my blog and submit your favorite recipe for a chance to get a feature posting! Love your page, I definitely need to tune in and visit regularly. Hi Sean! Thanks for the great feedback. Those pancakes are truly delicious. I will definitely take a look at your blog! Thanks for stopping by.